The salty-sweet smell of the ocean and the pungent aroma of freshly caught fish waft on the sea-breeze in Zhejiang. With its abundance of rivers, lakes, canals, and beaches, it comes as no surprise that there’s always something aquatic on the menu in this coastal province. Zhejiang cuisine is heralded as one of the Eight Culinary Traditions of Chinese Cuisine, meaning its signature dishes are ranked as some of the most delicious in the country. The Zhejiang-style is characterised by its fresh, mild taste and the emphasis it places on the natural flavour of its key ingredients. To this end, many of the dishes are seasonal and are served raw or almost raw, similar to Japanese cuisine. Like Jiangsu and Fujian style cuisine, presentation is everything and diners in Zhejiang will be met not only by mouth-watering aromas, but also by an unparalleled visual feast. A myriad of techniques such as quick-frying, stir-frying, deep-frying, simmering, steaming, and brine-soaking are all skilfully employed by expert chefs in order to guarantee that each dish is cooked to perfection. There are three main sub-styles of Zhejiang cuisine: Hangzhou, Shaoxing, and Ningbo. Hangzhou-style is by far the most popular of the three and carries the most prestige, since Hangzhou was once the capital of the Southern Song Dynasty (1127–1279). It is rumoured that bamboo shoots, a favoured ingredient, will feature in nearly half of all dishes on an average Hangzhou menu. Shaoxing-style is well-known for its sumptuous poultry and freshwater fish specialities, as well as the internationally renowned Shaoxing Rice Wine, which has been brewed in the region for over 2,000 years. This dry, sherry-like liquor is made from fermented rice and an ancient strain of yeast that has been cultivated for centuries. It is normally aged for at least 18 months, but some varieties are up to 100 years old! 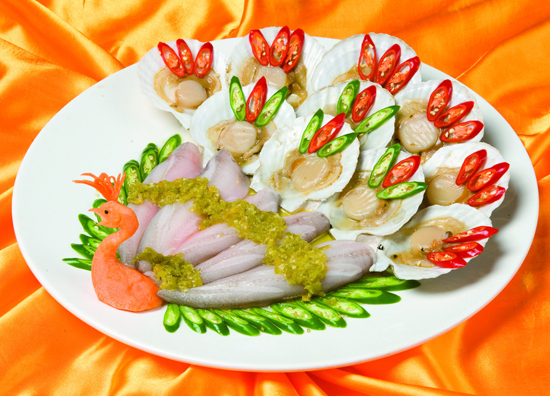 Ningbo-style is markedly saltier than the other three and is known for its splendid seafood dishes. It is also celebrated for its tantalisingly sweet confections, many of which date back to the Qing Dynasty (1644-1912). A visit to the coastal city of Hangzhou simply wouldn’t be complete without delicious seafood and a warm cup of aromatic Longjing tea. But why waste time going to a restaurant and a teahouse when you could get both of these signature ingredients on one plate? Longjing or “Dragon Well” tea is considered the finest green tea in the region, while river shrimp is a seasonal delicacy. You’ll have to get your timing just right, because the best Longjing tea is picked in early April and the juiciest river shrimp are caught at the start of summer. According to local legend, this unusual dish came about when the Qianlong Emperor of the Qing Dynasty was touring the region surrounding Hangzhou. He decided that, in order to truly learn what life was like in Hangzhou, he would disguise himself as a commoner. As it started to rain, a local woman invited him into her home and brewed him some tea made from freshly-picked Longjing tea leaves. He was so impressed by the taste that he pocketed some of the tea leaves on the sly before continuing his trip. At sunset, he arrived at an inn and ordered a plate of fried shrimp. He asked the waiter to brew him some tea but, as he reached inside his sleeve to retrieve the tea leaves, the waiter caught sight of the imperial gown hidden beneath his cloak. The waiter rushed to inform the chef and, in his panic, the chef accidentally added the tea leaves to the fried shrimp, thinking that they were spring onions. At this point, it seemed the only thing the kitchen was brewing was trouble! However, the emperor was so impressed by the dish’s colourful appearance and unique flavour that he was instantly won over, and so Longjing Shrimp was born. This refreshing and vibrantly colourful dish is made by first marinating the freshly caught shrimp in a mixture of salt, egg whites, starch, water, and Shaoxing rice wine. The shrimp is then flash-fried in hot oil while the Longjing tea is brewed separately. After about five minutes of frying and steeping respectively, the shrimp is removed from the hot pan and the tea leaves are separated from the boiling water. The oil is then replaced before the shrimp is re-added along with more salt, Shaoxing rice wine, and the Longjing tea leaves. Finally, a small amount of the liquid tea is added to the pan and left to heat until it boils. The plump sweetness of the shrimp is perfectly complemented by the bitter crunch of the tea leaves. This dish is held in such high regard throughout China that it was even served as part of a government banquet for President Nixon in 1972. During the Song Dynasty (960-1279), Hangzhou was administered by a government official named Su Dongpo. He is well-known throughout China for his three great triumphs: building the Su Causeway over West Lake; writing a magnificent poem in celebration of West Lake’s beauty; and the creation of Dongpo Pork. Talk about a Jack of All Trades! 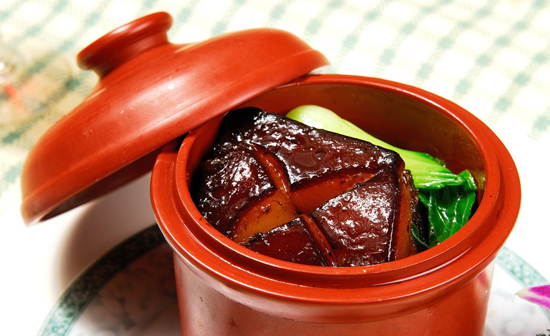 According to local legend, Su Dongpo had a marked preference for pork. Since the citizens of Hangzhou greatly respected him for his benevolence and wisdom, they all presented him with the finest pork they had to offer on New Year’s Day. Su Dongpo was delighted and, together with his family, he cooked the pork using a sauce made from Shaoxing wine, soy sauce, ginger, and sugar. True to his character, he then shared this delicious meal with the citizens of Hangzhou. 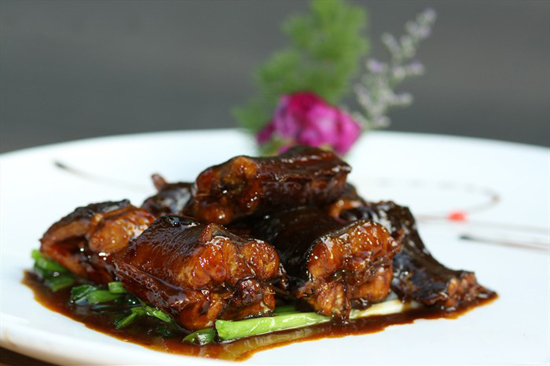 Thereafter, the dish was known as Dongpo Pork and remains one of the city’s signature delicacies. Yet this fragrant dish is a real pig to cook! First, you take some scrumptious pork belly, cut it into four pieces, boil it briefly, and then rinse it. Next, you put the pork in a pot with a mixture of sugar, soy sauce, onion, ginger, and Shaoxing rice wine, where it is sealed and cooked in the oven for about two hours. Finally, you remove the pork from the pot, place it in a bowl, strain the juices over it, and steam it for another two hours. The result is a tender, fatty dish that practically melts in your mouth. 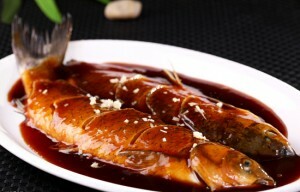 West Lake Vinegar Fish is another traditional dish from Hangzhou derived from a slightly less upbeat local legend. The story goes that there were once two brothers from the Song family who were both incredibly intelligent. They could easily have become officials, but decided to eschew the scholarly life in favour of a rustic one spent living and fishing near West Lake. Yet it seemed their simple dream was not to be. One day, a wealthy landowner named Zhao was walking past West Lake when he saw the elder brother’s wife bathing. He was enthralled by her beauty and, determined to make her his, he had the elder brother killed. The younger brother and his sister-in-law immediately consulted the local magistrate in the hopes of receiving justice, but little did they know that the magistrate was a close friend of Zhao. They were beaten and thrown out of court, leaving the elder brother un-avenged. Feeling weak and defeated, they returned to their home by West Lake and the sister-in-law demanded that the younger brother flee, lest Zhao come after him next. She asked only one thing of him: if he made his fortune, he must promise to eventually come back for her. Before he left, she cooked him a special dish made from sugar, vinegar, and a fish from West Lake. When the younger brother commented on its unusual taste, she said, “This fish is sweet and sour, just like life. When you have tasted the sweetness of a good life, please do not forget the sour oppression that us commoners face”. The younger brother was deeply moved by this sentiment and, as he left, the words resonated in his heart. Years later, he garnered great fame and fortune as a government official. His high authority allowed him to return to Hangzhou and eventually have Zhao arrested for his crimes. But, no matter how hard he tried, he couldn’t find his sister-in-law. Then, one day, he was at a banquet when suddenly he found a dish that tasted exactly like the one his sister-in-law had prepared for him all those years ago. He asked to meet the chef and, lo and behold, there she was. She had been working as a cook for a noble family in order to hide from Zhao. The younger brother was elated and immediately resigned for his high post, choosing instead to live a peaceful life once again by the lakeside with his sister-in-law. So it goes without saying that there’s a lot of heart in this dish! Traditionally it is made using grass carp from West Lake that has been left to cleanse in a tank for two days, ensuring that it does not have a muddy taste. The fish is then braised in a simple marinade of dark vinegar and sugar until it is cooked through, resulting in an aromatic dish with a sweet and sour tang. This unusual dish is one of the oldest in the Ningbo-style and is made using river eel. Many of the rivers and lakes surrounding the city of Ningbo have an abundance of eel, so this dish is almost always served up freshly caught. The eel is first steamed until it has softened enough for the bones to be easily removed and then it is braised in a mixture of spices until the flesh has turned an alluring golden-brown. The result is a tender, juicy dish that is full of flavour and packed with nutrients.